This is just a small sampling of the papers from my project. I will share more as time permits. The whole buried/weathered papers idea “buried” itself in my brain at some point while I was reading blogs over the past couple of years. I can’t say just how many blog posts I’ve seen about the subject. I mentioned that I had seen Gina’s blog and pictures of her beautiful papers. But take a look at her current post for more eye candy. But in all the excitement I neglected to mention Seth Apter’s Disintegration Collaboration Challenge and series of posts about the process. Begin there and you will see more links about this inspiring project. But wait — there’s more! 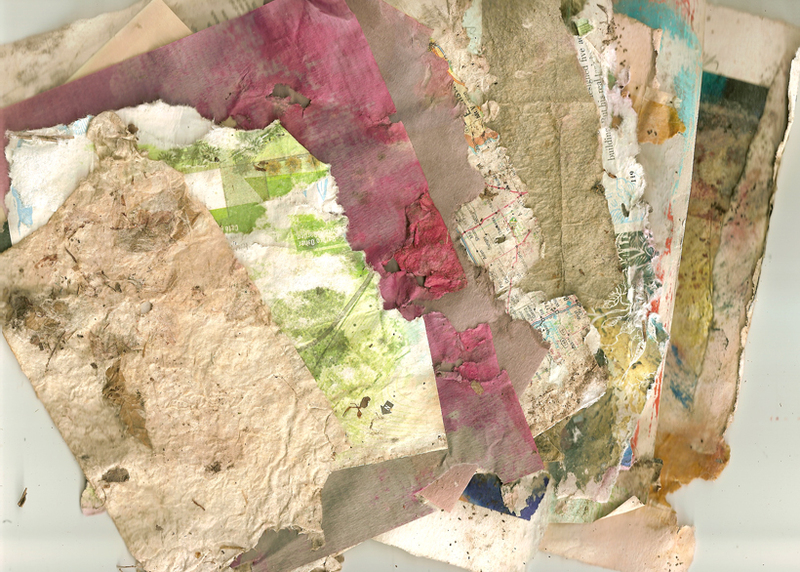 The most important and exciting thing at the moment is that Seth’s challenge and images shared by participants are included in the current (May-June 2010) issue of Cloth Paper Scissors Magazine! Congratulations, Seth. I have called my local craft store and they are holding a copy for me. I suggest that anyone interested do the same, or order it online, before they’re all gone. I’d probably make 2×2″ cuts which suggest a landscape or other features and give them pompous frames. Oooohhhh! What a beautiful idea. Yes! These buried papers look wonderful. They have a look of ancient knowledge and aging. Thank you, Jane. I am really excited about the outcome and look forward to making art with these. These papers are treasures Martha. And I am excited to see just what you create with them. Thank you so much for the link to my site and the mention of my article in CPS. It is greatly appreciated!